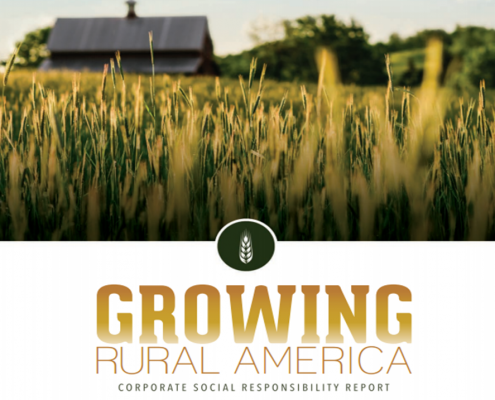 As one of the nation’s largest agricultural lenders, CoBank plays a vital role in supporting the U.S. farm economy. We also make significant investments in local cooperative development, young, beginning and small farmers, and local and urban food systems. In 2015, the bank made a total of $8.4 million in charitable contributions. Our Sharing Success program is a cornerstone of our corporate giving, matching the contributions of our customers to the causes they care about most. CoBank associates play an active role in our Corporate Social Responsibility programs. Each year, every associate is able to direct $500 from the bank to the charity of his or her choice. Associates are also given a paid day off to volunteer in their community, and the bank recognizes those associates who consistently give back through our Volunteer Service Awards. CoBank is an active supporter of organizations that promote the public policy interests of cooperatives and rural industries. At CoBank, we believe that sustainability is about making life better now while also helping to ensure a healthier future. In addition to our own internal efforts, CoBank is one of the largest underwriters of renewable energy in America, with $1.8 billion in loans and leases for renewable energy projects undertaken by our customers. CoBank is committed to supporting a wide array of initiatives that promote the growth and vibrancy of rural communities. With partners like our fellow Farm Credit organizations and the USDA, we are investing in programs that will strengthen the broader rural economy.